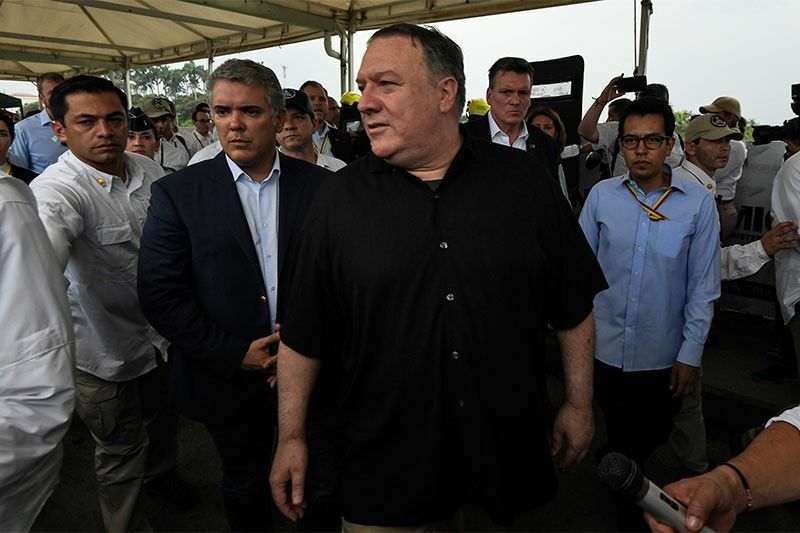 US Secretary of State Mike Pompeo (C), accompanied by Colombian President Ivan Duque (2-L) visits the international bridge Simon Bolivar, in Cucuta, Norte del Santander Department, Colombia, on the border with Venezuela, on April 14, 2019. Pompeo, who is on a four-nation tour of Latin American allies, finishes his trip with a brief visit to Cucuta, where he will meet Venezuelan refugees. All four countries of the trip are led by right wing or centre-right leaders favourable to Washington's uncompromising approach to Venezuelan President Nicolas Maduro. LIMA, Peru — US Secretary of State Mike Pompeo ended a visit to Peru on Sunday and traveled to the Colombian border city of Cucuta, crossed through by thousands of Venezuelans fleeing crisis under President Nicolas Maduro.